This spider is tiny, body + leg span approximately the diameter of one U.S. nickel. Abdomen is globular, appearing black with white markings (at distance appear almost as white spots). Cephalothorax is medium brown and Legs are translucent light brown with darker banding at joints. 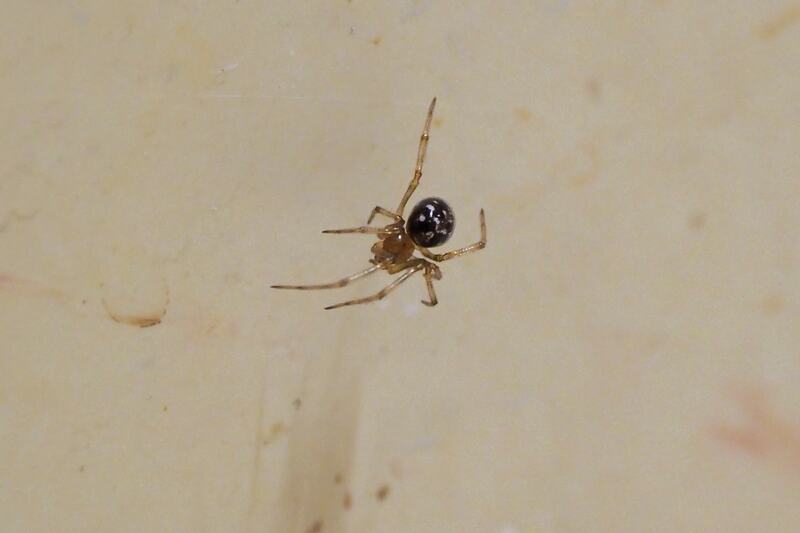 Large brown pedipalps and (photograph is not very clear) appears to have two large posterior eyes (other eyes not visible). Other photos available. Found in utility washtub. Hi, this is probably in the Steatoda genus, possibly Steatoda triangulosa. They are tangleweb spiders, the webs look messy and dirty. They’re usually found in quiet dark confined places away from people.